Business rates in England could be changed to help High Street retailers, Business Secretary Greg Clark has said. He told a fringe event at the Conservative party conference the role played by High Streets should be recognised and adjusting business rates “will be one way of doing that”. Retail groups say online shopping and rising business rates have left many High Street retailers struggling. The Federation of Small Businesses (FSB) welcomed Mr Clark’s comments. He said the Treasury is conducting a review of business rates, but his view is the High Street “makes a big contribution to the community, and to villages, towns and cities”. “And I think some recognition of that is required. Business rates will be one way of doing that,” Mr Clark said in Birmingham. Some experts believe the rise of online retailing, increasing staff costs and rising business rates have created a “perfect storm” for the High Street. Some firms across a range of industries are struggling to pay business rates – a tax calculated on a proportion of the property’s value – following a review that came into effect in April 2017. 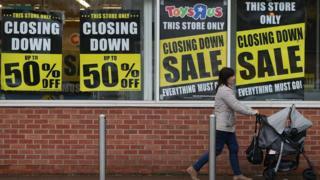 The British Retail Consortium said the retail industry paid £7bn a year in business rates. FSB chairman Mike Cherry welcomed Mr Clark’s comments and the potential for future changes to business rates. “Competition from online retailers has left many High Street firms struggling and confidence among small businesses in our high streets is falling,” he said. Last November Chancellor Philip Hammond decided to bring forward a proposed cut to business rates, which would see them rise in line with the lower Consumer Prices Index (CPI) measure of inflation, rather than the Retail Prices Index (RPI). However, the BRC said this did not go far enough and has called for the government to reduce rates further. CPI inflation hit 2.7% last month. The BRC fears that if the inflation figure stays the same in September, this will mean retailers will have to pay an extra £190m in annual business rates from April 2019. On Wednesday, the Welsh government decided to scrap business rates for children’s day nurseries in Wales after claims the industry was struggling to survive.